Really? We haven’t seen this artwork yet? Color me surprised. Here is not just another William Schmidt “double Travis” cover, but it features a skull as well! We’ve seen this motif before in Blue and Pink and this time there are no hidden pictures or X-ray effects, just the skull of … well … a hockey player, apparently, based on how many teeth are missing. There is a thumbnail sketch of the story with an extensive list of characters by “valis1949”. SPOILER ALERT! The sketch gives away everything in the plot. You can find it here. Have you seen me? 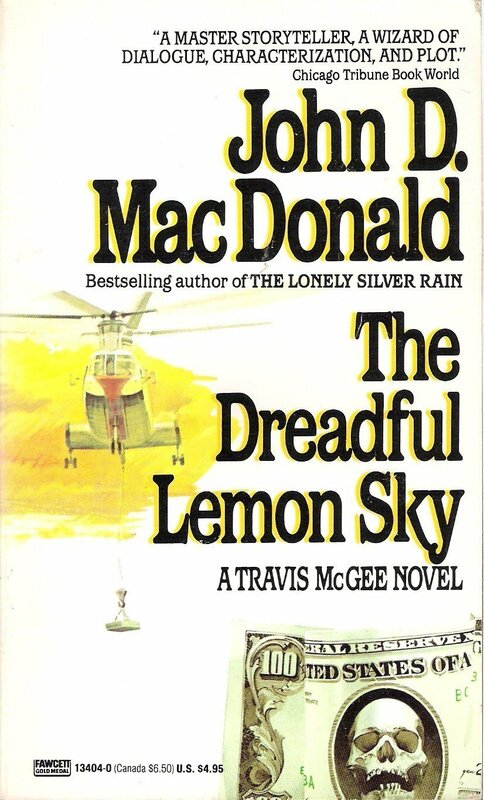 I am the 5th and 6th US printing of The Dreadful Lemon Sky, printed in 1977 and 1978 by Fawcett under their Gold Medal label (ISBN-10 0449139654, ISBN-13 9780449139653). My cover price is $1.75 and I have the Robert McGinnis artwork.